Chemokines are a group of cytokines with small molecular weight whose main action is the recruitment of leukocyte subsets under homeostatic and pathological conditions. Through interacting with chemokine receptors that are expressed on the cell surface as 7-transmembrane proteins coupled with G-protein to transmit cell signals following ligand binding. Activation of G proteins, by chemokine receptors, causes the subsequent activation of an enzyme known as phospholipase C (PLC). PLC cleaves a molecule called phosphatidylinositol (4,5)-bisphosphate (PIP2) into two second messenger molecules known as Inositol triphosphate (IP3) and diacylglycerol (DAG) that trigger intracellular signaling events; DAG activates another enzyme called protein kinase C (PKC), and IP3 triggers the release of calcium from intracellular stores. 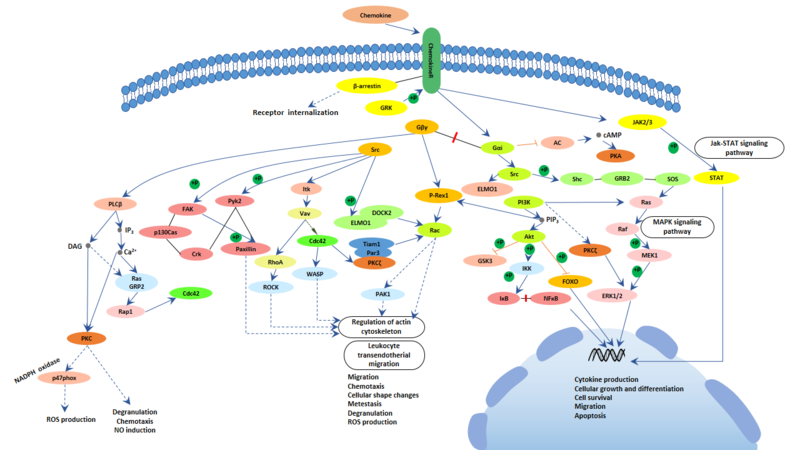 These events promote many signaling cascades (such as the MAP kinase pathway) that generate responses like chemotaxis, degranulation, release of superoxide anions and changes in the avidity of cell adhesion molecules called integrins within the cell harbouring the chemokine receptor. Through this mechanism chemokines can induce directed chemotaxis of responsive cells.